The impressive little SEAT Mii is now available with an automatic gearbox. The automated manual is the same gearbox that was recently added to the Volkswagen Up, which alongside the Skoda Citigo, is the sister car to the Mii. Prices start at £10,390. Unlike the Up, SEAT is only offering the automatic gearbox with the more powerful 75PS version of the 1.0-litre engine and in mid-level SE trim. There are no plans to offer it with the lower 60PS version. The good news is that the lightweight and compact gearbox is actually slightly more economical than the five-speed manual it's based on. According to the official figures it's 2.7mpg more efficient averaging a claimed 62.8mpg. CO2 emissions also drop marginally from 108g/km to 105g/km, although this makes no difference to annual VED which remains Band B - currently £20 a year. While Volkswagen calls the gearbox ASG, SEAT is simple sticking to Mii Automatic but it's the same system which does away with a manually operated clutch and instead uses an electric motor linked to a pair of electromechanical actuators to handle gear changes. There are the standard automatic gearbox modes of D (Drive), N (Neutral) and R (Reverse) but there's no P (Park) mode and no crawl function. There are no gearshift paddles either but you can change gear manually using the lever. Performance is only slightly dampened with the Mii Automatic taking 13.9 seconds to accelerate from 0-62mph - 0.7 seconds slower than the manual equivalent. The SE trim includes 14-inch ‘Silva’ alloy wheels, a leather steering wheel and gear knob, gloss white dash panel, chrome dial and switch surrounds, heated electric door mirrors, air conditioning, electric front windows, electronic stability control, remote central locking and a six-speaker stereo. 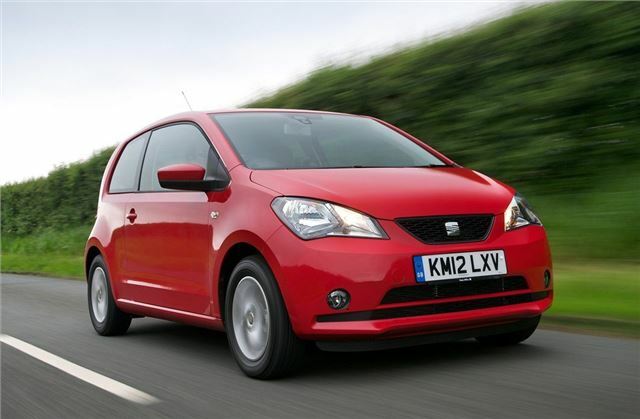 The Mii Auto is available as both a three-door an a five-door with prices of £10,390 and £10,740 respectively. You can order it now and the first cars will arrive in early November. Meanwhile, every Mii ordered before the end of September comes with a free SEAT Portable System, the excellent full colour, touchscreen infotainment unit that includes satellite navigation, Bluetooth hands-free phone operation and full stereo integration. The removable unit usually costs £275. Drove a basic manual one the other day as a courtesy car, superb little thing, far more 'big car feel' than the new Panda and better value than the VW. Think I'd have the Ecomotive though, unless a diesel is coming.